“The new EU safety and environment regulations in the European Standards EN 1504 for protection and repair of concrete structures is literally promoting hydrodemolition robots to comply with the new environmental and safety standards,” said Roger Simonsson chief executive of Swedish hydrodemolition equipment manufacturer Aquajet. So what are the latest developments in hydrodemolition robots? Aquajet recently launched the updated demolition robot, Aqua Cutter 710V evolution 2.0, which is replacing Aqua Cutter 710V. The new model has several new functions and improved features. The new design has increased reach and handles more force. The new tower system gives a torque stiffness that is 10 times higher and each 1m section is 8kg lighter, with easy hook-on for quick assembly. A quick connection at the front facilitates quick change of accessories, such as different width of roller beam, radius roller beam, rotolances and circular power head, without using any tools. The new front cover has upgraded splashguards and the side covers can be removed without the need for tools. A new interactive graphic display provides for faster and easier programming, which decreases set-up times and makes control easy. With a smooth lance control with a new core for positioning, all movements are more precise and smooth providing better lance control and increased lifetime of mechanical parts. New speed zone settings are available and enhance the possibility for more accurate removal. The zones can also be used to control the lance angle and oscillation. The radio control with display operating the robot can also incorporate the control of the Power Pack for increased performance and safety. It is possible to read and set the operating parameters, such as operating pressure of the robot and Power Pack right from a safe distance. All settings are displayed on the operator’s screen. To enhance safety according to the European standards and Machine Directive, Conjet has developed the safety circuit where the robot and Power Pack are considered as one unit with one emergency stop. Conjet has always connected the robot and pump with a cable in order to immediately shut down the machine and water pump with the emergency stop, no matter where the operator stands. Conjet has also developed a patented, wireless connection between the robot and the high-pressure pump to facilitate work for the operator and maintaining safety with the emergency stop for the complete system as one unit. Conjet’s latest water-cooled and air-cooled Power Packs offer reduced sound level and improved fuel consumption. With the new air-cooled technology, Conjet has reduced fuel consumption by 4% to 5% and sound pressure level stays at 69dB(A). With the new water-cooled system fuel consumption has been reduced by 7%-8% and sound pressure level to 64dB(A). 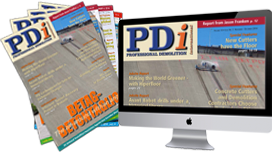 In the European hydrodemolition and water jetting industry there is a wide conscientious that stricter regulations on environment and safety are coming rather sooner than later. That was also the main focus on the water jetting forum Towards European Standards that was held in Brussels on 14 October. The event was organised by the European Water Jetting Institute in cooperation with national water jetting associations and several water jetting equipment manufacturers and contractors. So, how can the industry get together to work towards European standards on working methods to comply with EU safety and environment legislation? 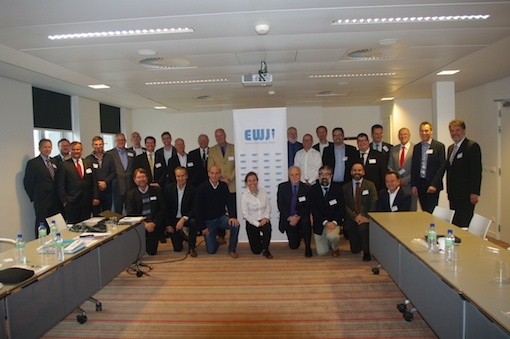 “If we don’t agree upon and propose standards of methods and quality ourselves in the industry, the European Commission is going to do that for us and imply regulations on us, so we have to act now,” said EWJI manager Jose Blanco. For example, how should companies in this business be accredited? How should workers be qualified and certified? The questions came up for debate and suggestions of how to proceed came from the UK Water Jetting Association and the Dutch association, SIR. “As a whole, this is quite a young industry. So young that we do not consider ourselves an industry, but more part of the construction business. And we are very creative to develop more tools and methods, but we need to get them certified and consider ourselves as a good industry where safety comes first,” said Blanco.